WOW that looks awesome, Denis. You wouldn't be into making an extra one up, by any chance, would you? Norman if Grant agrees that you can have a panel. Then i would be happy to share the panel design with you. I can't just share stuff with his graphics without his permision. But if he agrees you could have a panel like this to. Should I email Grant about this, then? Loads of thanks, man. Yeah email him or maybe a phonecall? thanks for posting that layout. i like the vertical flow of the subgroupings in each logical control grouping and the space allowed between them...this was something i was thinking about/working out in my own design (avoiding a design that pulls my visual attention in multiple directions or is just too busy). Here's the sub panel, finished and ready for the sliders. another idea for the subpanel--what if: instead of measuring/drilling/countersinking each slider mounting hole on a subpanel, two rectangular slots were cut out, allowing variable mounting locations of each slider (for a little more 'wiggle' room)? there might be more room for error between the front panel and the subpanel, and it might be way cheaper to make as an FPE panel. just thinking out loud here. I think the only issue with that, (which I kinda mulled over a bit at the time) is how close the subpanel is to the main panel. If, like me, your spacings mean that you want it flush, a slot won't work, as you'd have to put angled edges on it to accomodate countersunk screws, and then they would "spread" the slot. If, however, you ditch the spacers on the sliders, use short mushroom head screws to mount the sliders in the slots, and then set it back from the main panel by putting washers on the switches (between panels) then this would make clearance for the mushroom heads. I suppose you wouldn't really need washers, It would all sit flat anyway because of the size of it. Just be sure the switches thread is long enough for both panels and the depth of the screw heads. I'm kinda impressed that I came up with the same idea as was used on the MS20. I'm still contemplating the slider vs rotary pot but I know if I do sliders, I'm just going to cut out a big ol' hole instead of individual slots. I figure I'll slap some of that craft foam or felt in front of the sliders to catch dust. was your panel done by shaeffer? would you mind uploading the fpe file if so? Thanx for letting me use yours as a basic idea. But i changed a lot, but i liked the main idea! thanks! your panel hits some of the main points for me (like a din jack for midi) and I'm not super adept at FPE just yet so a reference to play with would be awesome. Holy crap! If those are 7211's (number seems to indicate it), that's a helluva good deal. Love those 7211's. Is anyone else having any problems viewing page 2 of this thread, or is it just my crap computer? I just looked at page 2 ok. Must be at your end. page 2 is a bit heavy on the attachments. took a few peoples suggestions in such as giving more space on the left for left hand tweakage and flippage. also tightened up my graphics a bit more, starting to get the hang of front panel designer i think. that's what i call compact. i like it. It's almost done but i need to think about it. Nope i should check it out. Because this price makes no sense. And i am not 100% happy with the layout yet. Thanks to Etaoin for the panel layout. I modified it a little to suit my system. There are more pictures in this thread on a swedish electronics forum. Yes, very nice. I really like the table top box approach. Cool stuff fur sure! I wanted a tabletop-box for the Klee because I thought it'd be good to have the controls close to me and no patch cables hanging over it. It looks really good in front of my modular! ok, so ive been mulling the panel layout day and night. 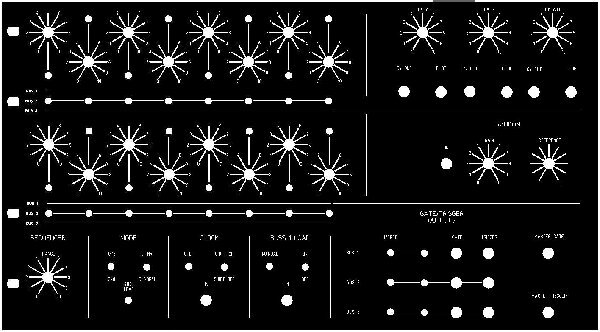 it feels like an obsession--im dreaming about panel and i wake up thinking about soldering anyway, i decided that i would at least proto one or two designs in easily-obtainable/cheap material before i get the nerve (and cash) up to do a proper FPE panel. so, without boring you with the mental journey ive taken, i found my enclosure: a wooden box. it has a working area of about 12" high x 15" wide for all panel components, and there is room inside for its own PSU and the circuit boards. the leds would be in the center. then the rotary pots (no sliders). then the bit enable switches. finally, the gate bus switches. its basically a rectangular radial shape. ill try to provide a layout soon, but this is probably a good description. i would like to hear any thoughts about shortcomings or disadvantages of this design (BEFORE i start drilling )--thanks!